Dance is an integral part of any culture. 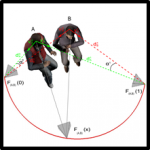 Recent computing advances have enabled the accurate 3D digitization of human motion. Such systems provide a new means for capturing, preserving and subsequently re-creating ICH which goes far beyond traditional written or imaging approaches. However, 3D motion data is expensive to create and maintain, encompassed semantic information is difficult to extract and formulate, and current software tools to search and visualize this data are too complex for most end-users. SCHEDAR (leaded by Univ. of Cyprus) will provide novel solutions to the three key challenges of archiving, re-using and re-purposing, and ultimately disseminating ICH motion data. Partners are Algolysis Ltd, Univ. of Warwick, Univ. Reims Champagne-Ardennes. 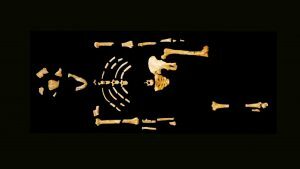 The ANR project HoBiS (Hominin Bipedalism, leaded by Museum National d’Histoire Naturelle) is a pluridisciplinary research project (LAAS/CNRS, Univ. Rennes2), fundamental in nature and centred on palaeoanthropological questions related to habitual bipedalism, one of the most striking features of the human lineage. 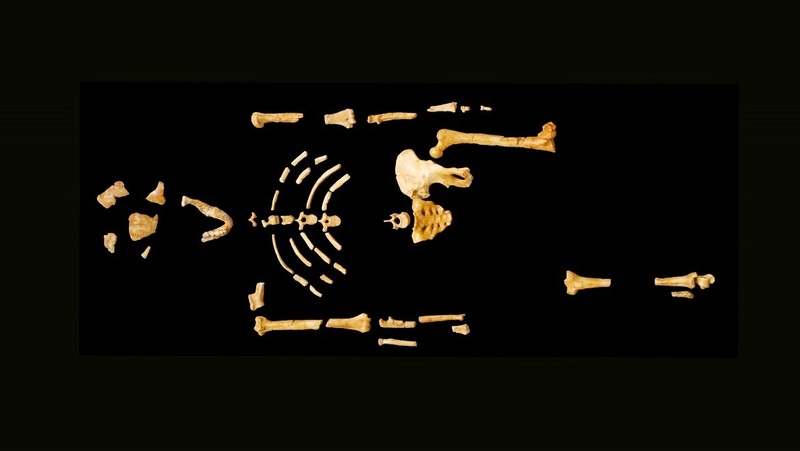 Recent discoveries (up to 7 My) highlight an unexpected diversity of locomotor anatomies in Hominins that lead palaeoanthropologists to hypothesize that habitual bipedal locomotion took distinct shapes through our phylogenetic history. We will develop a work flow and software package to generate plausible anatomical and musculoskeletal models given the available fossil specimen data and what can be hypothesized (e.g. mass distribution, muscle properties) based on other specimens and other species, including living models. For the first time, this will allow to explore the parameter space spanned by our knowledge about fossils and extant animals, enabling palaeoanthropologists to propose hypotheses to reconstruct the whole model and address its anatomical variation. The ANR project ENTRACTE is a collaboration between the Gepetto team in LAAS, Toulouse (head of the project) and the Inria/MimeTIC team. The purpose of the ENTRACTE project is to address the action planning problem, crucial for robots as well as for virtual human avatars, in analyzing human motion at a biomechanical level and in defining from this analysis bio-inspired motor control laws and bio-inspired paradigms for action planning. For more information, please follow this link. 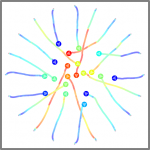 PERCOLATION is a young researcher project funded by the French Research Agency (ANR JCJC), led by Julien Pettré. The purpose of PERCOLATION is to develop next generation crowd simulators by mathematically formulating microscopic simulation models based on perceptual variables (especially visual variables). Agents are equipped with synthetic vision their reaction is simulated considering the pixels they perceive. The goal is to model a perceptual control law as close as possible to the real human’s perception-action loops that drive local interactions. Cinecitta is a 3-year young researcher project funded by the French Research Agency (ANR JCJC), led by Marc Christie. The main objective of Cinecitta is to propose and evaluate a novel workflow which mixes user interaction using motion-tracked cameras and automated computation aspects for interactive virtual cinematography that will better support user creativity. We propose a novel cinematographic workflow that features a dynamic collaboration of a creative human filmmaker with an automated virtual camera planner. We expect the process to enhance the filmmaker’s creative potential by enabling very rapid exploration of a wide range of viewpoint suggestions. The ANR project CHROME is a collaboration between INRIA-Grenoble IMAGINE team, Golaem SAS, Archivideo and the Inria/MimeTIC team Toulouse (head of the project). The purpose of CHROME is to develop new and original techniques to massively populate huge environments. 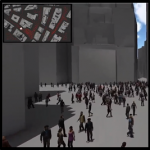 The key idea is to base our approach on the crowd patch paradigm that enables populating environments from sets of pre-computed portions of crowd animation. The question of visual exploration of these complex scenes is also raised in the project. 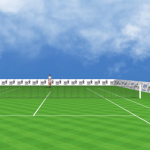 The INSEP project “Perception et action au tennis : une approche pluridisciplinaire centrée sur le retour de service” is a collaboration between the French Tennis Federation, the University of Caen Basse Normandie, the University of Paris Sud 11, the University of Rouen and the University of Rennes2. The purpose of this project is to study the perceptive and motor processes involved in the performance of the return of serve. A multidisciplinary approach is done to analyse the anticipation, reaction, displacement and visuomotor coordination skills in real situation, in laboratory environment and in virtual reality. The ANR TecSan project REPLICA is a collaboration between Dynamixyz, Supelec, Hôpitaux de Saint-Maurice, CRPCC and M2S/MimeTIC team (head of the project). The purpose of REPLICA is to build and test a new rehabilitation program for facial praxia in children with cerebral palsy using an interactive device. 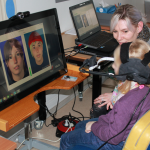 The principle is that during a rehabilitation session, the child will observe simultaneously on the same screen an agent, the virtual therapist’s one performing the gesture to be done and a second avatar animated from the motion the child actually perfoms. This Cifre contract with Faurecia group aims at developing new ergonomics assessments based on inaccurate Kinect measurements in manufactures on real workers. In the first part of this project we developed a framework to evaluate the accuracy of the Kinect sensor when used in ergonomic assessment (coll. with Ecole Polytechnique of Montreal). 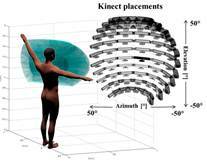 We then proposed an example-based framework to improve the quality of the Kinect data for ergonomics. 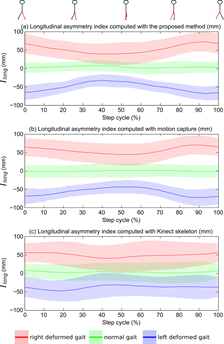 The aim of this project is to design innovative approaches to monitor patients in clinics with two main illustrations: detection of gait events such as footstrikes, and designing a new asymmetry index, both based on Kinect data. This project is a collaboration with Université de Montréal and Imperial College of London.